While two students smoke a cigaret in one of the ruined buildings of the school, the other one keeps a close watch for teachers in the area. 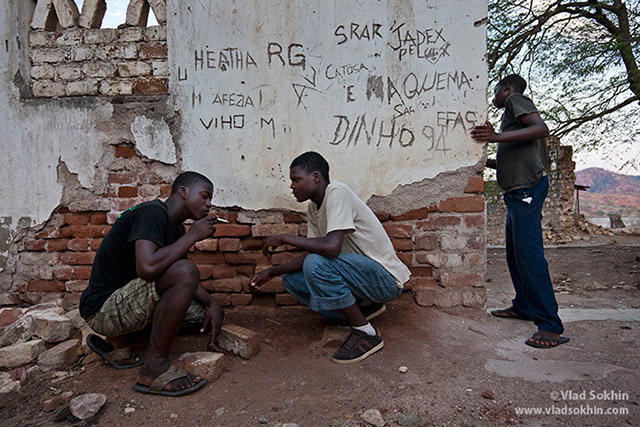 The Boarding school of Boroma village in Mozambique is experiencing the worst of times. Dilapidated buildings of the ex-Catholic mission inherited from the time of boarding of Portuguese colonialism go to ruin, not being repaired since 1975. The Government has allocated almost no money to maintain the educational process at school at a proper level. More than a hundred pupils live in appalling conditions and are compelled to not only find money for studying, but sometimes for food.